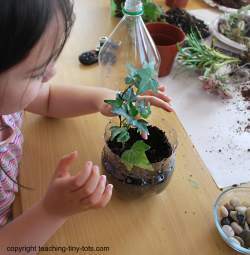 Toddler Science: Make a Soda Bottle Terrarium with your child. 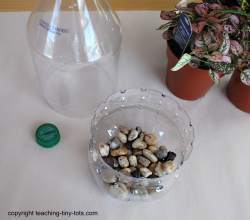 Toddler Science: Create a terrarium with a plastic soda bottle. A fun Green Project for kids. 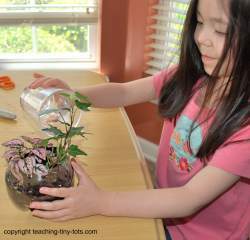 Planting is a great kids science activity that introduces many concepts naturally. 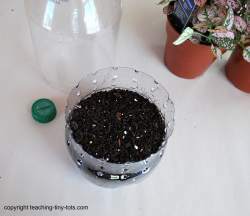 Using a soda bottle, make this easy terrarium. Great as a classroom activity too. Small stones or pebbles to line one to two inches deep on the bottom. Paper plate to remove plant from pot and separate individual plants. First, put one inch of coarse sand, gravel, or pebbles. This is the drainage layer that captures excess moisture. Add 3-4 inches of potting soil. Select the plants you want. Remove from pot and gently separate a single plant. With plastic spoon dig a small hole where the plant is to be placed. Plant your plants carefully. Create a small hole and set or tip your plant in. Make sure all roots are in the hole. Fill soil on and around the roots, and tamp down lightly. Add a spoonful of soil if necessary. Give space to grow between plants. After adding your plants, add water to make soil moist but not soggy. Slide top of bottle over the bottom. If it is too tight, make a small 1/2 inch slit on each piece and fit together carefully. Put the cap back on the top of the soda bottle. Gather all the materials needed before beginning this toddler science activity. Cut the soda bottles ahead of time. When selecting plants, choose ones that have similar growing conditions. Since you don't want to keep it in direct sunlight, read the growing conditions on the tag at the store. Keep your Terrarium out of direct sunlight. Direct sunlight can cause temperatures in the enclosed environment to rise rapidly and your container will get foggy. It is best to use a spray bottle to spray water into the container rather than pouring it in. Close the container and check it daily for the first few days. If the soil appears too dry, add a little more water. If it appears too moist and the container becomes foggy, take the top off for a while to allow some evaporation. You can find some of the materials at the Dollar Tree or similar stores. Pebbles, containers and even the peat moss. Each store may vary their selection so call ahead. Terrariums are a self contained environment. Once they are established, they need nothing from the outside except a little indirect sunlight. If it is placed in the right amount of sunlight, they thrive without water for several days to a few weeks. Moisture in the Terrarium evaporates from the soil and plant leaves. 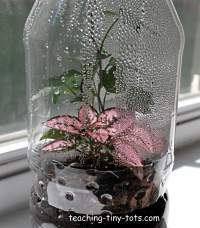 It condenses on the Terrarium walls (sides of the soda bottle) You can point out the water droplets to your child to show how the plants are being watered. The condensed water then falls down and re-moistens the soil. As long as the top is sealed, this process will continue for months. Note that on the first couple days, the container may appear cloudy...by the third day water droplets started to form. Using a glass container is another option. This of course must be done with close supervision and have a safe place to put it when finished. The glass container allows for easy viewing of all the layers. When selecting your container make sure your child's hand can fit easily into the top of the container. 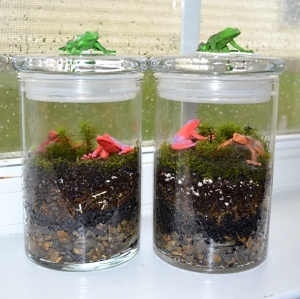 Fun plastic figurines make this terrarium special!